Many years ago, when I was first pegged as a "sustainable landscape designer," I gave a talk to a group of students enrolled in one of the world's first sustainable design courses at Schumacher College in England. I was surprised during the question and answer period that almost all the students' questions were not about their work, but revolved around how they could address issues of sustainability in their personal lives. How they could conserve energy and water in their households, for example—it was these questions that started me on the path to writing and publishing my book, Wild by Design, which lays out principles for achieving sustainable and life-enhancing landscapes. The most frequent questions I get from homeowners are about pests—how to discourage mosquitoes, for example; how to encourage pollinators; and how to manage storm water. Here are some basic ideas. I hope others will add to these ideas, and maybe create more of an open source manual to help people who want to design their own landscapes in ways that are more sustainable. Animals (more properly, creatures), aromas, and aridity. Small ponds with fish can reduce the load of larvae that become mosquitoes. This is an uphill battle, requiring vigilance in terms of pond management to keep populations of fish up. Similarly, bat houses can attract mosquito-eating species, but there are many requirements for making them work, and many placements—in the shade, mounted on a tree trunk, for example—are not successful. There are many online guides to building ponds and placing bat houses to discourage mosquito breeding. 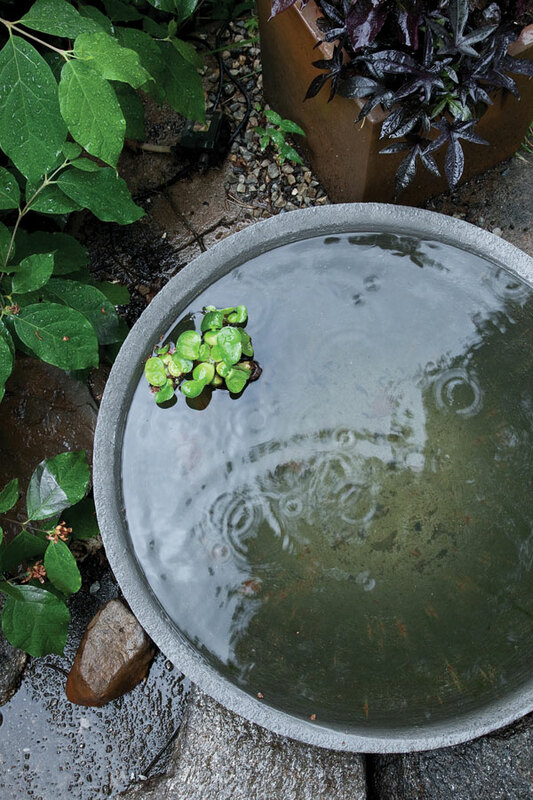 Removing standing water helps—remembering that roof gutters and sometimes even big-leafed plants can hold water long enough for mosquitoes to breed and hatch. There are also methods of introducing the kind of pungent aromas that mosquitoes hate—from planting marigolds, catnip, or beebalm, to spraying plants with a garlicky (but expensive and obnoxious-smelling to humans) cocktail—that have worked for me. The trick to reducing mosquitoes is constant work. There is a real science to knowing how to encourage pollinators, including not just knowing which native species to attract but understanding their nesting habits, etc. There are many guides online for encouraging bees and other pollinating species; one rule of thumb is to avoid cultivars of any sort, but even this is not a hard and fast rule. Cultivars are often hybrids that do not produce the exact pollen of the original. This is really disappointing to people who love certain cultivars, want showier flowers, longer bloom time. There are, however, cultivars that will breed true. The trick to encouraging pollinators is in doing your research. This is perhaps the easiest problem to address, with the rule of thumb being broad and shallow versus narrow and deep. Letting rain water out into the garden rather than piping it away is easy to do if you have enough land. Avoid narrower and deeper channels, which are more likely to cause erosion and degradation of the whole system. Instead, create gentler bioswales with taller meadow plants, shrubs, or tree, which can disperse more water over a bigger area, allowing the roots to absorb more water and reducing the amount of runoff downstream. 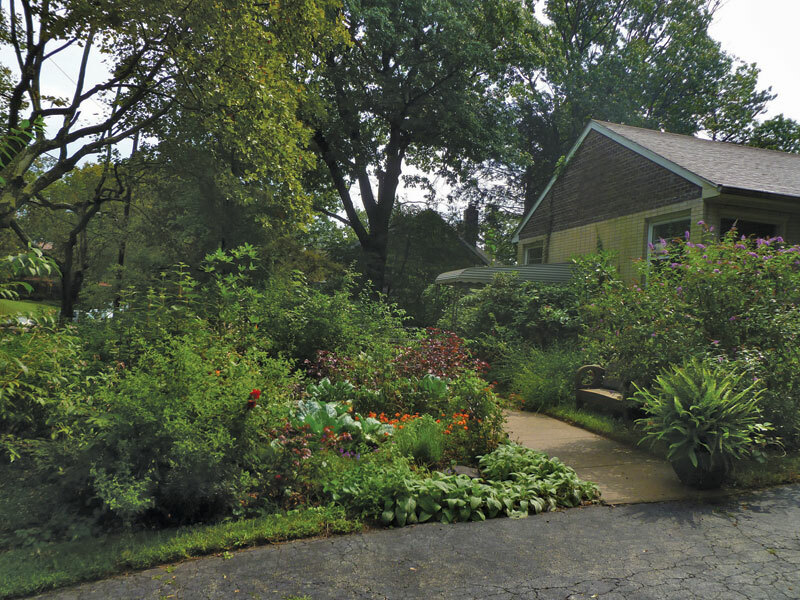 The trick to integrating sustainable storm-water management into your landscape without just problem solving is multi-layered design. I do not mean to imply that it is only constant work that will repel mosquitos, nor is it only research that will help a homeowner encourage pollinators, nor is it just design that will manage storm water sustainably. What makes the landscape feel cohesive, and makes all of these components work together, is good design. Just problem-solving—a pond here, native plants everywhere, a swale there—can result in piecemeal design. Including features such as ponds, selecting plants that will breed true, and integrating storm-water dispersal and ground-water recharge—to make it all work together, feel inevitable and of a piece, takes practice, not just in designing on paper but in actually constructing the landscape. One of the most important lessons I think we ever learn in landscape is that the last phase of work, the actual construction, is one of the most critical design phases. The decisions that we make in this last phase are generally based on our eye—how things look going into the ground—but it’s also a time to implement design to solve problems like pests. Ultimately, it’s in this phase that we can make the difference between a place that looks as if it was built yesterday, and a functional place that feels as if it has been there forever. Margie Ruddick, principal of Margie Ruddick Landscape, has designed numerous high-profile projects including New York City's Queens Plaza, Shillim Institute and Retreat in India, and the Living Water Park in Chengdu, China. She has taught at Harvard's Graduate School of Design, Yale, Princeton, Parsons School of Design, and more, and has received extensive recognition for her contributions to landscape design, including the Cooper Hewitt National Design Award.